If you are looking for ways to convert more of your site visitors to registered leads, consider enabling the user registration feature in your account. This allows you to control where and when your site visitors are prompted for registration during their search process. Choose what locations in the search process will trigger the prompt, such as the Property Details view, the Property Search form, Top Picks/Hot Sheets, or Search Results. To enable user registration, login to your account Control Panel and select User Registration from the Clientsmenu. The list of settings might look overwhelming at first but they’re very simple once you get familiar with them. The built-in Help system in your account Control Panel will clearly explain each setting in detail. 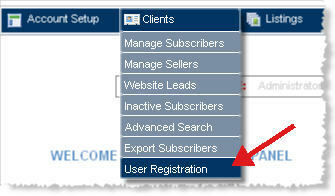 Click on Show Help after selecting User Registration from the Clients menu.